Home » Reviews » What Is The Best Deodorant For Men? 1. Which Is Better To Use, Deodorant Or Antiperspirant? Issues with body odor, pit stains, and dark underarms can all be solved with the right deodorant. The problem is, there are so many deodorants in the market today and choosing the best one for yourself can take a lot of time and money. To help our readers get the right products for themselves, we took the liberty of doing extensive research and testing to find the best deodorant for men. Take a look at our list below to see which deodorant you should get! Which Is Better To Use, Deodorant Or Antiperspirant? Deodorants and Antiperspirants are two different things that many people often get confused with. Deodorants are used for body odor problems while antiperspirants are used to solve excessive sweating issues. Since Antiperspirants have gotten a bad rap because of the unhealthy effects it can have on the body; we are focusing on helping you find the best deodorant instead. Whenever you are about to purchase a certain product, you should always see to it that you have a set of standards that you can use as a guide to determine the best product for yourself. If you want to know what is the best deodorant for men, try to consider these following factors that we have used to come up with our list of the top deodorants for men. Men’s deodorants can come with different features that can be used to solve various underarm problems. The first thing you will need to do to find the right deodorant for yourself is to figure out what your underarm issues are. May it be too much sweating, dark underarms, body odor, or a combination any of these, you must make sure that the product you are getting will be the right fit for your needs. If you are looking for good deodorants for sweating and body odor, we suggest taking a combination of antiperspirant and deodorant for the best result. Deodorants can come in different forms including sticks, roll on, sprays, and even powders. The types of deodorant you choose will, of course, boil down to your personal preference, but do know that every type comes with its pros and cons. Sticks tend to be dry but can stain clothes pretty bad. Roll on underarm deodorant, on the other hand, can take a while to dry and can be a bit uncomfortable for some people. As for sprays, they are the most comfortable to use but can run out quickly. Most deodorants come with scents and fragrances that can help you get a fresh scent. Having a sweet smell is always a great thing, but the thing about fragrances is that it can sometimes irritate the skin. Even if you are looking for the best deodorant for odor, we recommend going with an unscented deodorant if possible. After doing extensive research, testing, and considering the factors that are essential for finding the best deodorant for men, we finally came up with a men’s deodorant reviews that contain all types of deodorants including moisturizing deodorant, dry deodorant, healthy deodorant, and not antiperspirant deodorant. So without further ado, here is the list of our top 5 best male deodorants. One of the best deodorants for men that you will be able to buy in the market today is the Bali Secrets Natural Deodorant. What made us include this product to our list is it's a completely natural formula that is guaranteed to provide you with a fresh and clean feeling. What’s great about this stick deodorant is that it doesn’t contain any parabens, aluminum chloralhydrate, and baking soda. It is an entirely gluten-free and vegan product that is made with ingredients that have been rated safe by the EWG.org. 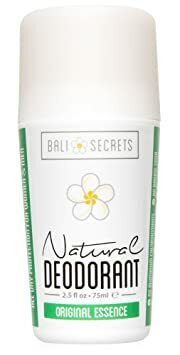 If you are looking for an organic deodorant for men that will not exacerbate any of your underarm issues while providing you with the means to get fresh underarms for the whole day, then look no more because Bali Secrets’ Natural deodorant is one of the best natural deodorants in the market today. Another thing that made us like this product is that all of the ingredients that were used to create it was organically grown in Bali. Lastly, this product can help you get the best value for your money since a single bottle of it can last for up to 3 months. As for its downsides, this deodorant doesn’t dry as quick as others, which may let you feel a bit uncomfortable at first. People who bought this product said that this is strongest deodorant for males in this list because of its strong scent, some even say that it is the best natural deodorant for men. Users also noted that this product works well during the hot season. Lastly, plenty of users loved how this product didn’t leave nasty yellow stains on their clothes. If you don’t like buying products from unknown brands, then we’re sure you will definitely like this men’s deodorant from Dove. 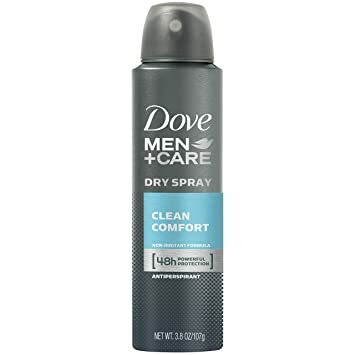 The Dove Men+Care Antiperspirant Deodorant Stick is deemed as the best deodorant for men who sweat a lot because it can help you solve body odor and sweating issues by providing you with fresh underarms for the rest of the day. This dove deodorant is deemed to be one of the best antiperspirant for men because its formula combination has been clinically proven it to be a non irritating deodorant that can provide your underarms with moisturization and freshness for the whole day. If you suffer from excessive sweating, applying this product to your underarms will let you get dry underarms throughout the day. Aside from coming from a well-known brand, another thing that we liked about this product is that it has this incredibly portable design that makes it ultimately easy to bring with you pretty much anywhere else. On the downside, it does come in a rather small amount. Unlike other deodorants, this one can only last you two weeks of use. Users who bought this product loved its packaging. It was contained in a small and sleek container that can easily be placed inside a bag. Users also said that this is the most effective deodorant they have used because it performs as advertised. However, some users did say that they needed to reapply this product at least two times a day to get the best results. Nonetheless, users still consider it as the best deodorant for body odor according to the majority of the users. If you aren’t really into roll on and stick, then you may want to check out this dry spray antiperspirant deodorant from Dove. Without a doubt, the Dove Men+Care Dry Spray Antiperspirant Deodorant amongst the best deodorants for men in the market today not only because it comes from one of the most well-known deodorant brands, but because it performs as advertised. What we liked about this Dove deodorant is that it comes with a clinically tested formula that has been proven to be non-irritating. We also loved the fact that this antiperspirant deodorant comes with a moisturizing ingredient that can help you get hydrated underarms. Perhaps the thing we loved the most about this spray deodorant is how it can quickly get dry upon application. The packaging is also made well since it has a portable and sleek design that makes it easy to place in any bag. On the downside, it doesn’t last long. Both its scent and effect can only last half a day. You will need to reapply it at least twice a day for the best results. Being so may only last you two weeks until you run out if used daily. A lot of users recommended this product as the best antiperspirant for men because of its quick drying feature that will provide you with the utmost comfort when used. Some users also consider this product as the best smelling deodorant for men. The only downside is that it doesn’t last you the whole day. You will need to reapply it at least twice a day. It’s also not the longest lasting type of deodorant since it is in a spray bottle form. 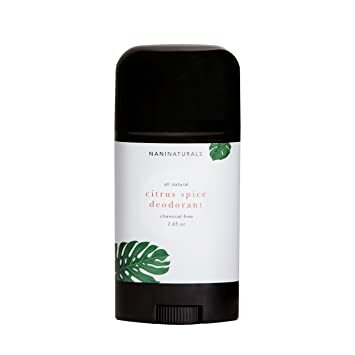 Another great natural deodorant for men that you can buy in today’s market is the All-Natural Citrus Spice Organic Deodorant. If you are looking for a product without the nasty chemicals, then this one will surely get your attention. What made us include this product to our list is its formula that uses 100% vegan and 100% organic products. It’s also completely gluten-free, chemical-free, aluminum-free, and paraben free. With this alcohol free deodorant at your disposal, you will be able to get protection for your underarms for the whole day. Another thing that we liked about this product is that it comes with a nice natural smell. Unlike other deodorants in the market, this one’s scent doesn’t overwhelm the senses. However, it still has its own set of cons. Just like most all-natural deodorants, this one doesn’t dry immediately and can feel a little bit sticky once you apply it. It’s also not the easiest product to find in stores. People who have used this deodorant enjoyed how it provided them with the best results during the hot season. People also loved how this product was made with entirely natural ingredients. However, users did mention that this deodorant can take some time to dry, which may be unappealing to some people. 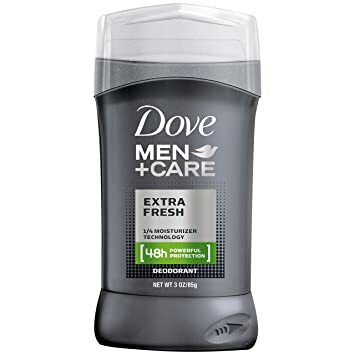 If you are a solid dove fan, then you might want to check out our fifth best deodorant for men which is the Dove Men+Care Deodorant Stick. Unlike other dove deodorants in this list, this one is a deodorant without antiperspirant. Just like other Dove Men products in this list, this deodorant stick has been clinically tested and proven to have non-irritant ingredients, which makes it a great deodorant for sensitive skin. Another great thing about this product is that it comes with moisturizing properties that can help you get hydrated underarms. But what we liked the most about this non antiperspirant deodorant, is that it can last for more than two weeks of daily use, and that’s even if you reapply it a twice a day. This product also comes with a great scent that will not overwhelm your senses. On the downside, it does tend to leave this white residue on your underarms and your clothes. It doesn’t also last as long as the labeling says, which is 48 hours. The effect of this product can only last for up to 10 hours. Plenty of people who used this product enjoyed how it is completely dry upon application. Users also loved the great fresh scent that this product comes with, which wasn’t overwhelming to the senses at all. As for its cons, users did say that the product didn’t last 48 hours and that you will need to reapply it throughout the day for best results. It’s also a deodorant that doesn’t stain clothes according to many users. Ran out of deodorant or don’t have access to any of the top men's deodorants we have listed above? Don't worry, here are a couple of substitutes for deodorant that you can use to get rid of body odor. One great substitute for deodorant si baking soda . It is an ingredient that is known for its antibacterial properties. Simply mix ⅛ tsp of baking soda with a couple of tablespoons of water and apply it to your underarms to solve odor and sweat problems. Other great substitutes for deodorant are lemon juice and apple cider. Both of these ingredients can effectively deodorize your armpits by riding your body of nasty odor-causing bacteria. Simply apply lemon juice or apple cider to your armpits with a cotton ball and reapply throughout the day for best results. Another natural astringent that you can use as a substitute for deodorant is witch hazel . Apply a small amount to your underarms using a cotton swab to clean rid your underarms of bacteria and trapped oils and moisture. The only problem with using witch hazel is that it takes a while to dry. If you are looking for a deodorant substitute that can quickly get dry, rubbing alcohol is one thing that you can immediately use. Alcohol can be used as a cheap deodorant because it also possesses ingredients that kill bacteria that cause body odor. Simply apply some to your underarms throughout the day for best results. Another gentler substitute for deodorant is coconut oil. What makes it a great substitute is that it comes with antimicrobial properties, a subtle yet fresh scent, and moisturizing properties that will help you get clean and fresh skin throughout the day. Before we end this article, we’d like to give you a couple of useful tips that you can try for yourself to get the best results from deodorants. In our list of tips, we will also tell you about some things that you can do to prevent body odor. The first tip that you may want to try is maintaining a hygiene routine where you will keep you underarms constantly germ-free. Since body odor springs from bacteria, one key to maintaining a body odor-free body is proper hygiene. Always wash your underarms with antibacterial soap to keep it clean. The next thing you may want to do is wear airy clothes. Clothes that are too warm to wear can cause you to sweat, and where sweat appears, bacteria can thrive. Odor-causing bacteria can grow in moist areas of the body. This is why keeping your body parts dry can significantly help prevent body odor. Lastly, whenever you use deodorants, make sure that you check the labels and ingredients first. This is to be sure that you won’t use products that can irritate or harm your skin. If you aren’t sure about the products you are using, you may want to consult a dermatologist first. There you have it! A complete guide on what is the best deodorant for men. After doing extensive research and testing, we have finally concluded that the best deodorant for men is no other than the Bali Secrets Natural Deodorant. What made us conclude this product as the best among the best is it's completely natural formula that is free of any harmful chemicals that have the potential to be detrimental to one’s health. Moreover, even though some people may think that this product has an overwhelming scent, we believe that it is the best choice for people with severe body odor since it’s scent can effectively cover B.O. Lastly, it can last you a long time. Even if you use it more than once a day, this product can last you more than two weeks of use.